Liz Halsted Policy, Plans and Sustainability Manager, Auckland Transport Liz has worked in NZ, Australia and the UK in integrated transport strategy, technology, sustainability and demand management over the last 16 years. 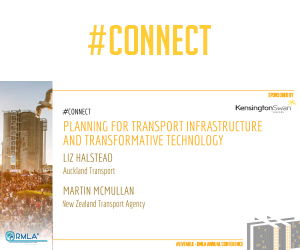 Liz currently develops policy and strategy for Auckland Transport including looking at emerging technology policy and the role it plays in Auckland’s integrated transport system and balancing movement and place. She returned to NZ in 2014 after working for 11 years in London at Camden Council and Transport for London (TfL). Liz sat on the UK Intelligent Mobility working group until 2014 which helped develop the first autonomous car trial in Milton Keynes. Liz led on the development of Europe’s first ultra-low emission zone an emissions based road pricing scheme which is being implemented in central London, and developed a transport emissions road map for London up to 2040. From 2005 – 2010 Liz ran an innovation precinct in London which trialled many things including: the UK’s first on-street charging points and developed London’s EV charging network (Source London); pollution eating paving; car sharing; carpooling; London’s cycle hire scheme; Legible London (London’s pedestrian way-finding scheme and bio-methane (used cooking oil) rubbish truck trials. #Connect is proudly sponsored by Kensington Swan.